Here is a recent example of a garage conversion we undertook in Rea Valley Drive, Northfield, Birmingham. This added approximately, 12.5 square meters of additional living space to the home. The garage formed part of the original dwelling when built back in the early 80’s. Of course, cars were much smaller back then, so in 2015 the garage was no longer fit for purpose and because a storage area. The purpose of the conversion was to provide a dining room facility that was accessible via the kitchen. This two bed compact home, was occupied by a small family, so having the dining room facility that could be used on a day-to-day basis was far more beneficial, than having a garage. This drawing is subject to copyright © David Vidgen 2015. If you wish to use this drawing, please contact us. Like most garages built in the 80’s, it is not uncommon for the developers to avoid having a foundation at the front. 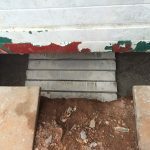 Because the front of the garage involved the erection of a new wall, window and was taking much of the weight of the roof, building control requires the installation of a suitable footing. In this case we dug down to approximately, 1200mm removing a large amount of clay and soil which was disposed of using grab hire by Trice and Allen. We uncovered a shared foul drain pipe that run directly through the centre of the garage at approx 800mm below ground level. Where you are building over a shared drainage pipe, permission needs to be sought from your local water authority, in this case it was Severn Trent Water. The build over process requires that any foundation should be 150mm lower than any foul pipe. This was the reason we had to dig down deeper than the standard 1m – even though it was good ground. We shuttered the concrete off either side of the pipe leaving 150mm in all directions, then filled with 20mm shingle. We then used 6 concrete lintels, placing the ends on either side of the concrete pillars. This formed a suitable bridge over the pipework. We then filled the remaining footing until we reached just below ground level. Class B engineering bricks then formed the basis of the wall construction up to damp course. 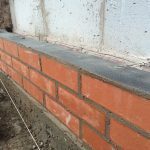 In this case, in keeping with the existing house brickwork, a 20cm damp course was used. The front of the garage was then constructed of brick and an 1800mm x 1200mm uPVC window. 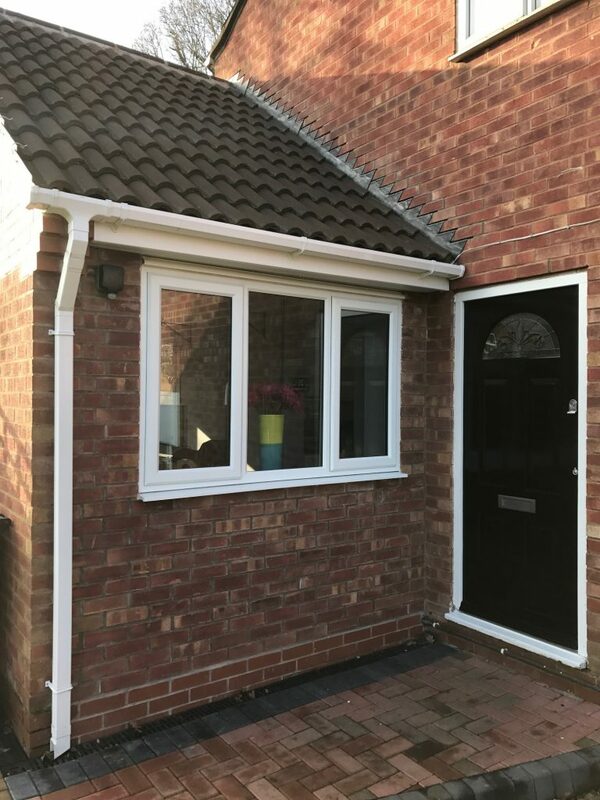 One of the challenges we found was that the original house brick was no longer available on the market, so in order to keep the appearance the same, we reclaimed the bricks we removed when knocking through a 1200mm opening into the kitchen. This provided us with enough facing bricks to complete the front of the conversion. 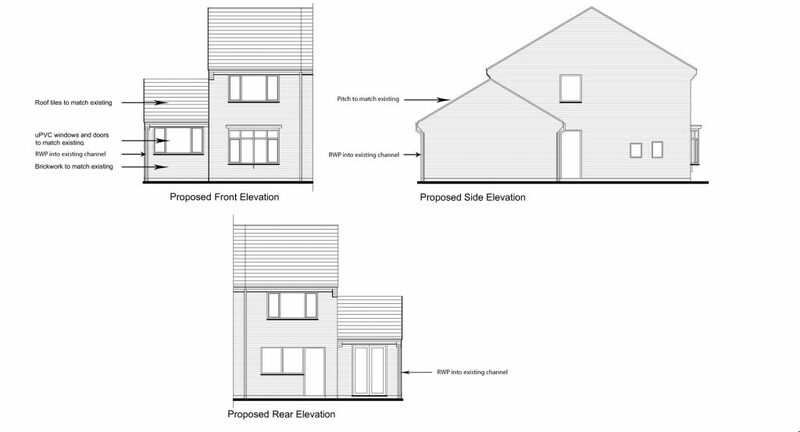 In many case planning permission is not required, however on this occasion because we were changing the roof from flat to pitch (and it faced a public highway), planning permission was required. Because the new roof formed an abutment with the original house wall, we installed cavity trays. This was necessary because directly below the abutment was a new lintel, forming the entrance from the kitchen into the new dining room. 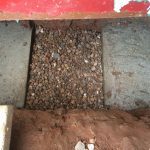 The purpose of the cavity tray was to ensure that should any water enter the cavity (because of the increase water exposure due to the abutment) the cavity tray would dispose of them accordingly. This was done to satisfy building control. We also installed a continuos soaker along the abutment. This allowed us to leave a channel of around 50mm between the roof tiles and the lead flashing. This is a more common method to avoid having to mould the flashing over the top of the tiles. The roof is in close proximity to a oak tree, which in the autumn case considerable leaves to to dropped in the vicinity. The 50mm channel, is sufficient to avoid too many leaves getting stuck, but leaving enough space to easily clean the channel should this be required. We used Redland Regent No2 tiles to keep in character in line with the existing dwelling. Ridge tile clips were also used to satisfy building control. Where the gas pipe entered the front of the new wall, a plastic sleeve was used to allow the pipe to pass through the 100mm cavity. The use of a sleeve is a building regulations require, so should the pipe fail, gas would not enter the cavity. 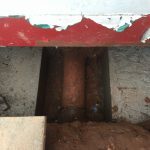 The gas passes under the floor, this was protected using the appropriate masking tape, and we laid damp proof plastic along the top to avoid any cement or concrete contaminating the surface of the copper pipe. Finally, we instructed Prestige Eco Clean and their builders cleaning services on completion of the projected. They ensured the development was cleared of all builders dust and mess and all the signs that building work has taken place. The path and driveway was completed by New Drives and Landscapes Ltd. They are providers of tarmac driveways in Birmingham, and on this occasion we used a combination of modern block paving and black SMA tarmac.